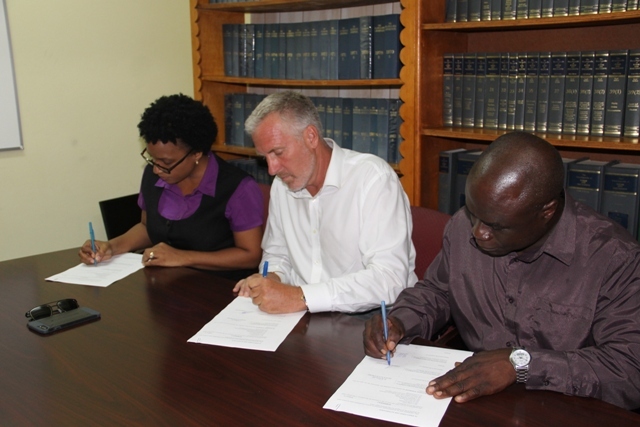 NIA CHARLESTOWN NEVIS (July 18, 2017) — In its continued quest for a cleaner and healthier environment on Nevis, the Nevis Island Administration (NIA) through the Nevis Solid Waste Management Authority, signed an agreement with US-based ENCLAVE Resources on July 17, 2017, for the disposal of waste metal and cardboard on the island. Representative for ENCLAVE Resources, Mr. Geoffrey Folsom, in brief remarks at the signing ceremony at the Legal Department’s conference room, stated that once the contract takes effect on September 1st, 2017, after setting up equipment at the landfill, the first phase of the project will include cleaning material as stockpiled there over the year at the Long Point Landfill. He said they would also move aggressively to collect abandoned items around the island, in areas the Authority deems important for cleaning. Phase one of the project is expected to take 18 months. It will also include maintaining the efforts through the implementation of resource separated recycling programmes at various business places which the Authority deems important for cardboard and metal. 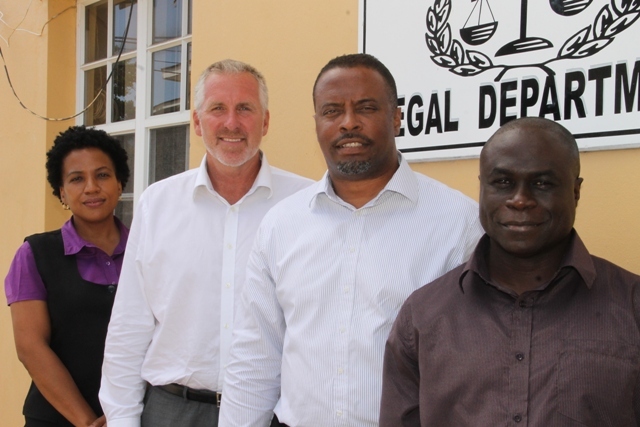 Mr. Folsom, believes that his company which was set up was set up specifically for recycling purposes in the region, will be stewards of the environment for Nevis into the future. He said the principals of ENCLAVE Resources come from a background including building, owning and operating a large material recovery facility in transfer stations primarily in California They are also actively involved in the treatment of municipal waste. Meantime, Deputy Premier of Nevis and Minister of Health Hon. Mark Brantley who witnessed the agreement signing, said it signalled a significant step forward for waste disposal on Nevis. Mr. Brantley, expressed hope that the partnership would take care of a particular troubling area of waste -old cars, stoves and refrigerators- which continue to occupy a significant amount of space at the landfill. He noted that in recent times the Authority has seen an increase illegal dumping of “White Goods” or in the case of abandoned vehicles, which are left on properties, both pose health risks as breeding sites for mosquitoes and rodents. Mr. Brantley, said the abandoned vehicles and wreaks also pose security risks, since they can be used as hiding places for illicit items. The Health Minister, stated that while the project is not the only solution to the island’s waste management other means to tackle the issue are being considered. However, due to the troublesome nature of that particular category of waste, it is felt that if the pressure is moved off the landfill, it will provide an opportunity that will give the island’s only waste facility a few more years of productive life. Mr. Brantley, used the opportunity to thank the Authority’s Manager Andrew Hendrickson who he said pushed for the partnership and Permanent Secretary in the Ministry of Health Mrs. Nicole Slack-Liburd for her continued service to the people of Nevis.